As the students of Bauhaus-Universität Weimar, all of us have been on semester vacation! Having a break is a brilliant way of looking back in order to realize what we have come through lately. As a masters degree student, the previous semester was my first and I was open to all kinds of ideas that I could get from the instructors, classmates, and my new city Weimar. In my first article for Bauhaus.Botschafter, I have written the memories and experiences about our excursion to Berlin as the Public Art and New Artistic Strategies department. The second activity I would like to mention in this article is a workshop called Along the Train Tracks. It started by the 4th of December and took us around one month. Given by Natalia Irina Roman who defines herself as a city researcher and installation artist, it helped us realize many things that some of us have never noticed before. Our syllabus didn’t work in a familiar way. As it can be seen from the name of the workshop, instead of being in the class, we were on site, in-between the train tracks to discover. Natalia has been interested in the signal boxes (as the German word “stellwerk”) for a long time. She has been making detailed researches and getting in contact with authorities in order to re-use them. Stellwerk is a building type that connects the disparate parts of a rail line and links them together to allow the safe passage of trains. Starting from the late 1800’s, they have been residing in the selected spots; by the side or in-between the train tracks. With the development of technology, they started to lose their function. Today, especially the younger generations are not even aware of their existence. Although, they used to be as necessary as any other services that a city can offer: from the banks to pharmacies, from the stations to grocery stores. They have a very unique feature; being one of the only building kinds designed to serve for one specific function. Most of the buildings in the cities, no matter for what purpose they have been built of, they can be used for other purposes when they are out of the main use. On the other hand, signal boxes cannot be turned into a house, a store or an office. A signal box should serve only as a signal box due to its plan and location. This is why they are considered as a city heritage. This is why they have been empty and left to decaying since the new systems have started to take a position. Well, I wasn’t aware of any of these until we started our trip series to visit them. For the very first one, we met in front of the Stellwerk Theater which is by the side of Weimar’s main station. Somehow, we had the perfect spot to meet which matches with our theme. 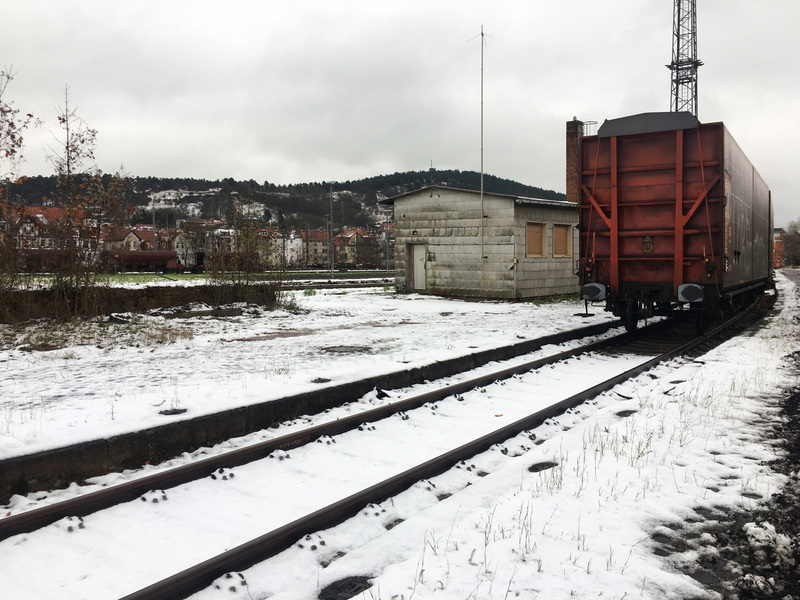 We took the train together, as a team of around 30, and started our first field research on our way to see the stellwerk in Eisenach. The building is situated by the side of the rails and is located on a deserted area. Passing by empty carriages, we took off the train on the main station and walked to reach there for about 15 minutes. We were assigned to document our trip by taking photos and videos, doing sketches, or recording sounds depending on our personal interest. My main focus was the style and architecture of the buildings. The one in Eisenach has a solid form with pink walls. It doesn’t reflect a rustic or traditional feeling. As all the other signal boxes do, it contains wide windows which are now covered with wooden plates in order to prevent anyone from entering inside. Wishing to pursue details from both inside and outside, we started to collect all the data we might need along the way. Our second stop was the following day, to Camburg. This stellwerk proved me that these kinds of buildings own a certain kind of function but not style. Unlike the one in Eisanach, we ran into a very conventional design in Camburg. At the end of our trips, I realized that they all have one sad thing in common: They are all empty. Signal boxes are all over the world wherever there are train tracks. I started to search online about their history. When I reached the present-day, I came into some brand-new architectural design projects that intend to take attention to their importance and potential new functions. As she was telling us on the way, Natalia’s aim has been to create projects for these beautiful structures and turn them into spaces for art exhibitions. With her recommendations, we read articles about how the trains were found and how they altered our perception and relevance of time and space. There were also some texts about observing our surroundings and paying attention to details. As the outcome of this process, each of us created artworks and/or ideas that are inspired by the workshop. We turned our studios at the school into one big exhibition space. We have been left free to decide what kind of procedure we would like to use to show our opinions: from photography to videos, from sketches to installations. Together with Natalia and the founder of our department, Liz Bachhuber, we took little tours from rooms to rooms to listen to what everyone has done.